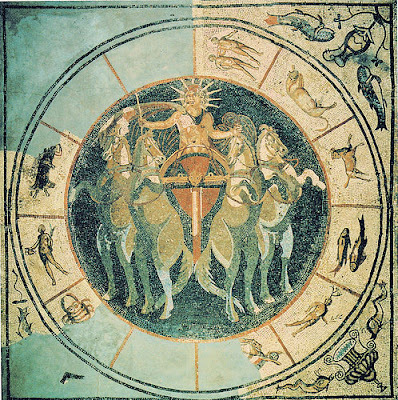 Two gods were born on 25 December, to wit, Sol, the Invincible Sun (Sol invictus) and the ascendant Christ. Whose day was it, really? What the good bishop imagined was that, during the last years of paganism, the cult of Sol remained so popular that the Church Fathers could only neutralize its celebration on the [traditional] winter solstice of December 25th by setting the birthday of Christ on that very same day. In other words, they snatched the day and, sooner rather than later, Christ trumped Sol. 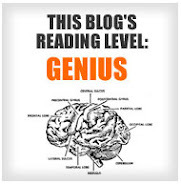 This view is now almost universally accepted; but is it true? There are those who have determined [the day] of our Lord’s birth; and they say that it took place in the 28th year of Emperor Augustus, and in the 25th day of [the Egyptian month] Pachon [May 20]... Further, others say that He was born on the 24th or 25th of Pharmuthi [April 20 or 21]. Clement dismissed such dates out of hand. Instead, his own calculations showed that Christ was born on November 17, in the year 3 BC. A century later, a God-inspired theologian announced that Christ, the new "sun of Righteousness", was born on March 28 since the Creation began with the spring equinox (= March 25] and the Sun was created on the fourth day. So that was that (or so he thought). Before long, however, another learned priest calculated that the birth date was April 2 in the year 8 AD -- 5500 years to the day after the Creation, as he had worked it out himself. And then, of course, there were many who celebrated 8 January (Epiphany), still Christmas day in many Orthodox churches. But no one had yet suggested December 25th. It is only with the famous Calendar of Philocalus (a list of the early bishops of Rome and Roman festivals) written in 354 AD that we find, given for the year 336, December 25: natus Christus in Betleem Judeae, "Christ was born in Bethlehem of Judea". The Roman cult of Sol existed from the earliest history of the city until at least the time when Christianity became the exclusive State religion (380 AD). The notion that the sun was divine was in Roman eyes a matter of visible fact rather than faith. As a divinity, the sun was clearly due divine honours. He had at least four temples in Rome. We know of cult statues, as well as public feasts at one time or another on August 8th, 9th, and 22nd, October 19th - 22nd, and December 11th and December 25th. The curious thing is that December 25th was the sole festival of Sol to fall on an astronomically significant date. Obviously the new sun is 'born' on the winter solstice when the days will start to lengthen but what exactly did the pre-Christian Romans celebrate on that date? Although Sol was favoured by emperors before and after Aurelian (r. 270-275 AD), there is no doubt that Aurelian intentionally elevated the sun-god to become one of the top divinities of the empire. 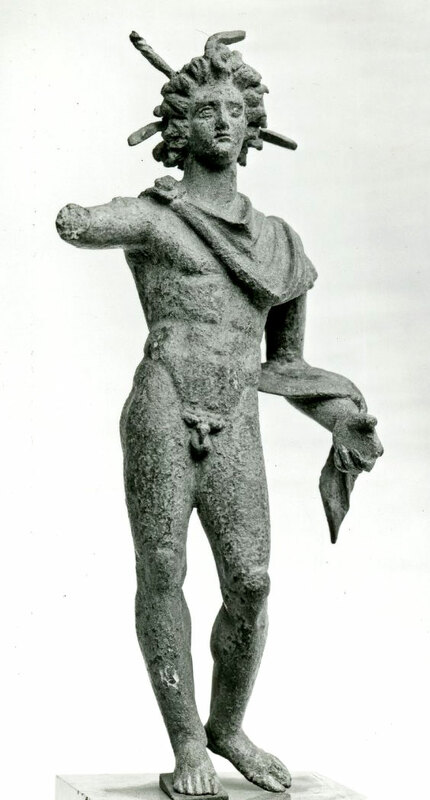 Earlier priests of Sol had been generally from the middle ranks of Roman society, simple sacerdotes in a lower class public cult. Aurelian raised them to the level of pontifices, an office now filled by members of the senatorial elite. To be a priest of Sol was now a top prestige post. In the year 274, to celebrate his victory over Zenobia, Aurelian inaugurated the festival of the Sun-god in Rome. 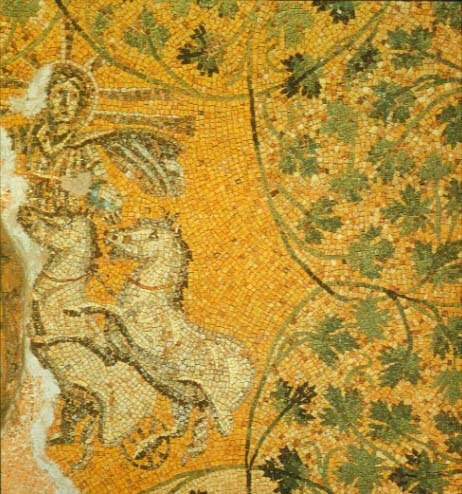 The god he had in mind was Sol Invictus, "the Unconquered Sun", but the god he had in hand was Bel-Helios of Palmyra. When the emperor had destroyed Zenobia's city the previous year, he despoiled the Temple of Bel: Aurelian, we are told, removed from this temple the statue of Bel-Helios to a new home in Rome. He built a temple for the god on the eastern Campus Martius, today between the Via del Corso and the Piazza San Silvestro (so Bel may still be lurking under the church of San Silvestro in Capite). 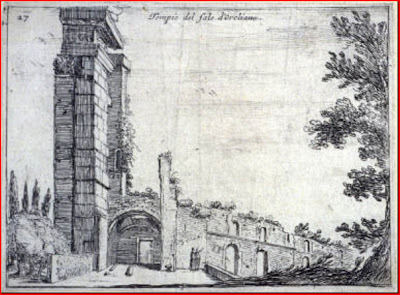 Something of this huge temple remained on the site until at least 1629 when Giovanni Battista Mercati made this haunting etching (above left) of its ruins. The temple incorporated eight splendid porphyry columns most probably transplanted from a temple in Palmyra; three centuries later these were transported by Justinian to Constantinople, to adorn his new church of St Sophia. Aurelian established special Games in honour of Sol to be held every four years and kicked off the event with 30 chariot races. It was widely assumed [and I, too, assumed: see my post on S. Silvestro in Capite] that these games were held on December 25th. According to the Calendar of Philocalus, 30 chariot races took place on that day to celebrate the Natalis Invicti, that is, the birth of the Invictus (the 'Invincible' [One]). This feast, then, must have been the festival that the Church fathers wanted to displace with Christmas in their brilliant counter stroke against a dangerous pagan rival. Besides, there was already a pervasive use of the sun as metaphor for Christ in early Christian writings (e.g. the True Sun, Sun of Justice, etc). Christ came even closer to Sol with some of his early images resembling those of the Sun-god in his sky chariot (compare Sol above left, with Christ, below left). It makes perfect sense. And, nowadays, there is almost unanimous agreement that this is what happened: the church hijacked Sol's birthday. The problem is: we may have the story backwards. So whose Christmas is it? A recent doctoral dissertation by S.E. Hijmans at the University of Groningen (NL) takes a fresh look at whole kit and caboodle. * The new Dr Hijmans is the first to have noticed that there is absolutely no evidence to show that the Games of the Sun founded by Aurelian ever took place on December 25th. On the contrary, no feast day for Sol is mentioned on that day until 80 years later in the Calendar of 354 and, subsequently, in 362 by Julian the Apostate in his Oration to King Helios (the Sun). In fact, the Calendar lists a festival of Sol that was celebrated in 354 AD from 19-22 October culminating in an unparalleled 36 chariot races (instead of the standard 12 or 24 races at this time) -- an extravagance which seems to suggest not an annual festival but a rarer quadrennial event; thus, these are likely to be the Games dating back to Aurelian. Those games, first held in 274 AD and then every four years, would indeed have been celebrated in 354 (Philocalus' Calendar) and in 362 (Julian's Oration). So, if the Christians had wanted to take over Sol's most important festival, that should have been the multi-day games celebrated on 19-22 October. But hang on a moment! While Invictus is a common epithet for Sol (but not only for Sol), the word is not followed by any name telling whose natalis is being honoured. Whether celebrating the birth of a god, an emperor, a hero, or even an event, a name is always given -- except this one time. This is an odd omission for a time-honoured feast. In other words, the entry for December 25th in the Calendar of 354 may be a later insertion into an existing template for the calendar. While astronomically important, the date of the winter solstice is never elsewhere associated with the Sun-god. So one has to wonder if the festival for Sol on 25 December was actually quite new. There is a real possibility that the day was not dedicated to Sol until after the bishop of Rome first celebrated Christmas on that date in 336 AD -- a pagan reaction to a Christian feast, perhaps, rather than vice versa. If Sol were the copycat (and not the other way round), this would explain why December 25th was the only festival of Sol to fall on an astronomically significant date. This doesn't tell us when the Natalis Invicti of December 25th entered the Roman calendar, but it does appear to have overlapped (at least after 336 AD) with the celebration of natus Christus in Betleem Judeae on the same day. The Church fathers were, of course, aware of the cosmological significance of December 25th as winter solstice. That alone may have made it the most logical date to serve as the birthdate of Christ. 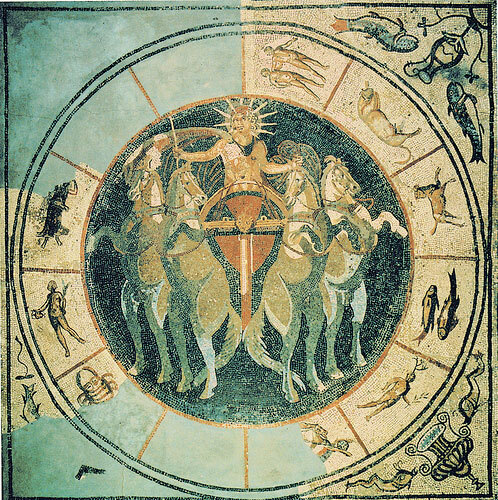 The sun played a role in the Roman world as a divine cosmic body and Christians could deal with the heavenly body, sol, whose cosmic nature, higher order, and reality was undeniable, without necessarily dealing with the pagan god, Sol. 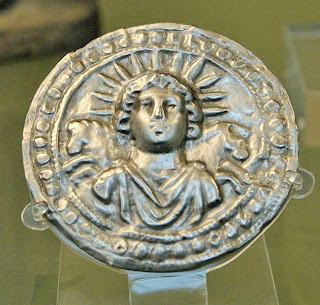 While they were aware that pagans called this day the birthday of Sol Invictus, this did not concern them and probably did not play any role in their choice of date for Christmas. At the very least, this new way of looking at the evidence casts doubt on the contention that Christmas was instituted on December 25th in order to counteract a popular pagan religious festival. Christ didn't have to trump Sol after all. Sol wasn't even in play. Enjoy your holidays with a clear conscience. More images of Aurelian's Temple of the Sun in Rome discovered by Roger Pearse (Thoughts on Antiquity). Not much is left but you get a good idea of its original immensity..
* S.E. Hijmans, Sol: the Sun in the Art and Religions of Rome, diss. Groningen, 2009; esp. Chapter 9. 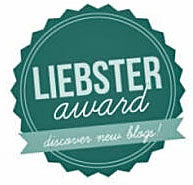 Thank you for this very interesting post, and for the kind mention of myself. A couple of thoughts: (1) I believe the story is not found in Dionysius bar Salibi himself, but rather in a scholion on his work, a century later. (2) I don't think that the Vatican mausoleum item is actually "Christ as Sol", as we see it widely reported on the web, but rather simply Sol. I loved that image from Mercati! I had no idea that any images of Aurelian's temple of the sun existed! And thank you so much for referencing so clearly all your sources for this. Hijman's work is very useful in clearing away some of the rubbish that is hanging around. I think he is a revisionist, so, inevitably, we have to be a little wary. But his questions certainly deserve answers. Roger, thank you for your comment. 1) You're absolutely right about Bar Salibi: the text comes from a scholiast and is thus later in date. 2) Why do you think that Sol would be depicted in a 3rd C. Christian mausoleum, under St Peter's itself? It doesn't seem to make sense. On the other hand, the paintings in the 3rd C Tomb of the Aureli are warning enough that the lines between Christian and pagan art were very fuzzy at that time. and what about Hippolytus of Rome? Very interesting article, thank you also for the link to Hijmans. 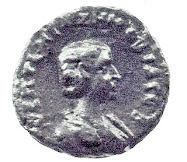 A very, very minor quibble: the coin of Aurelian in the body of the article is an antoninianus, but the reference in the list of illustration credits is to an aureus - not that it really matters, for other than the detail in the exergues the reverse design is identical. @Anonymous 1: Hippolytus, in Dan. 4,23 ms.A, proposed 2 April (according to Hijmans, p. 584, n. 8). I have no knowledge of the other manuscript traditions given in that link. @Anonymous 2: All that glittered was not gold; it is now. Thanks for the correction. Mithra is part of the Sun's story but not (as far as we can know) part of Christmas. I hope the editors of 'penelope' will take note and correct their page. 25 Dec is nine months after the feast of the Incarnation, 25 Mar. This was specified iirc because great prophets were believed to enter the world on the same day they departed. It is thus tied to Good Friday calculation. Since another calculation identified 6 Apr as Good Friday (and hence as the Incarnation) churches in the East celebrated Christmas on 6 Jan. The very fact that early Christians were celebrating Christmas on two different days in two different regions should indicate that they were selecting the date for their own reasons and not for any retrospective modern Realpolitick. I think you have the history and politics spot on here: that any 25 Dec Sol celebration rode the Christmas coattails. If so, this leads us to reconsider why the Church settled on that date in the first place. A connection with the Winter Solstice is interesting (as you say, ‘the most logical date to serve as the birthdate of Christ’), but not enough of an answer. Even though the Church Fathers took rather wild guesses at Christ’s birth, I’m interested in how those guesses were based on faithful calculations. So, my question about dating Christmas is, what theological reasons won out, or at least what theological reasoning helped justify the connection with the solstice? Sextus Julius Africanus was the first (as far as I know) person to offer 25 Dec as Jesus’ birth date, in 221 CE, well before any Sol/Christmas associations. His calculations of the Hebrew Bible timeline defended a spring equinox for the birth of Creation (25 Mar, 5501 BCE) and a symmetrical date for the conception of Christ (25 Mar, 1 BCE), which resulted, almost offhandedly, in a 25 Dec birth date. Certainly these sorts of Biblical calculations are based on wild apologetic assumptions, but the focus here was on God’s glory most evident in the spring. The birth date of 25 Dec did not (as far as I can tell) line up with any other historical considerations in his timeline. Nor was that question of a birth date very important for him, his theology or his contemporaries. So, it seems the first proposal for a 25 Dec birth date is a sort of implication of a broader theological perspective, rather than an argument in itself. [Notice also that Cyprian follows the same sort of calculations for a spring Creation and conception, but offers an added theological layer by proposing Christ to be born on the fourth day, namely 28 Mar, just as the Sun was born on the fourth day in Genesis.] You might be correct that later scholars more appreciated the symbolism of the Sun and Son being born on the winter solstice; but at the least, Africanus seems to have offered the world genuinely faithful reasons for calculating Christmas as 25 Dec.
Chrysostom also had an interesting rationale for celebrating 25 Dec. On one hand, he was late enough that one could accuse him of trying to prop up an on-going tradition. On the other hand, he was sincere enough to offer the first Christmas homily, about Jesus’ birth on ‘this day’, so that perhaps he really did care about getting the date right. His idea is to calculate when Zechariah was visited by an angel (Luke 1:8-13), thus when his wife Elizabeth conceives, thus when their son John the Baptist is born, thus when cousin Jesus was born… Imprecise, but impressive. Chrysostom found some rabbinical documents (heretofore suspiciously absent) that showed which priests were serving during the 70 AD Temple destruction. Luke tells us that Zechariah is in the Abijah class of priests, and 2 Chronicles tells us the Abijah served 8th out of the 24 classes of priests. Thus, by working backwards historically, Chrysostom determined that the angel addressed Zechariah on either Sabbath 2 Oct or 9 Oct, 5 BC. If we choose the later date because John goes home after his encounter, and if we give some room for ‘the sixth month’ of Elizabeth’s pregnancy, during which the fetal Jesus and John recognized each other (Luke 1:26, 1:41), we have Jesus born between 10 Dec, 4 BC and 10 Jan, 3 BC. Smack in the middle, viola, 25 Dec, 4 BC. Again, imprecise, but impressive. Most impressive (to me) is that Chrysostom is not trying to prove Jesus was born in 1 BC, as his predecessors aimed. Rather—if we give him a bit of charity—he is actually trying to follow the best data he has. Or, a cynic might argue instead that he is so preoccupied with justifying the 25 Dec date, that he’s willing to sacrifice the birth year. Either way, we have to assume that at least some people believed Chrysostom, and that some people were faithfully convinced in the date of Christmas. Thus, for whatever other reasons that governments, Church Fathers and regular Christians might have had for celebrating on 25 Dec, theology had a useful role as well. This is funny that so many folks are trying to twist this theory into pretzles to somehow serve an agenda to insist that a literal Jesus figure actually existed. IF there was a guy similar to Jesus that can be argued later. But to imply that the "Pagan" Romans placed their pagan holiday on Christs "Birthday" is a really ridiculous. IT wasn't just convenient to place "Christs" birthday on the 25h (because of some convenient pun on words) it is becuase that is who the CHRIST is. "He" is the BIRTH OF THE SUN.. That is what the entire mythology is about . The Roman Catholic church had a long history of worshiping various GODS and creating all sorts of new cults and religiouns depending on who was in charge at the time. The Roman empire is still in power in the form of the Catholic church. You all are just in continual denial about the truth. There are so many layers to this that include esoteric mystery religions regarding "Christ Consciousness" but the fact is, THe mass of the Christ is the solstice.. plain and simple..
Quit trying to make it more complicated and obtuse . "While astronomically important, the date of the winter solstice is never elsewhere associated with the Sun-god." Sorry, but this is absolutely false. December 25, the day of the Winter Solstice on the Julian Calendar, was observed for thousands of years as the birthday of numerous solar deities: Horus in Egypt, Tammuz in Babylon, Dumuzi in Sumer, Adonis and Apollo in Greece, etc. Ancient Egyptians commemorated the rebirth of the Sun with a midnight ceremony in which a woman dressed as the goddess Isis emerged from a cave carrying an infant representing Horus, the newborn Sun and reincarnation of his father Osiris. The ritual of the nativity, as it appears to have been celebrated in Syria and Egypt, was remarkable. The celebrants retired into certain inner shrines, from which at midnight they issued with a loud cry, 'The Virgin has brought forth! The light is waxing!' The Egyptians even represented the new-born sun by the image of an infant which on his birthday, the winter solstice, they brought forth and exhibited to his worshippers. 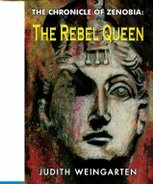 No doubt the Virgin who thus conceived and bore a son on the twenty-fifth of December was the great Oriental goddess whom the Semites called the Heavenly Virgin or simply the Heavenly Goddess…"